In this program you will begin and end your week enjoying all of the great things you love about Bryant Pond! 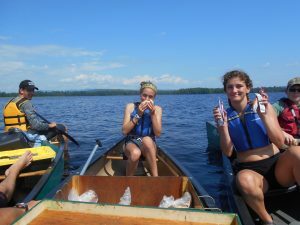 In between, you’ll spend 3 nights and 4 days in the peaceful woods and waters of Western Maine! On this adventure you will begin by paddling the historic Magalloway River into Umbagog National Wildlife Refuge. You’ll witness Bald Eagle nesting sites, Osprey, and various waterfowl along the way. Moose and deer are frequently seen here at the many foraging areas, and you will fall asleep to the sounds of Common Loon calls. Days will be spent practicing paddle strokes, swimming, and campsite skills such as fire cooking, shelter building, and axe and knife safety. After paddling Lake Umbagog, you will depart for nearby Table Rock in beautiful Grafton Notch State Park. You will spend a night in the mountains learning how to cook on a backpacking stove and learn what it’s like to have everything you need on your back. The week will wrap up back at Bryant Pond with our camp-wide cookout and campfire on Thursday night! Sunday: Registration, teambuilding, trip preparation. Monday: Drop Off at Magalloway River off Rt 16. Paddle to Molls Rock Campsite. Tuesday: Paddle from Molls Rock to Tidswell Point. Thursday: Hike down from Baldpate Shelter to Rt. 26 for pick up. Back to Bryant Pond for gear de-issue, mountain hike, swimming, showers, and cookout/campfire. Friday: Pack up and go home.